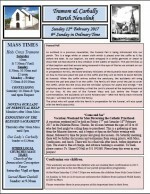 As outlined in a previous newsletter, the Funeral Pall is being introduced into our parish. This is a large white or cream cloth which is placed over the coffin as it lies before the altar. At our baptism, we were wrapped in a white garment or shawl to show that we had become a new creation in the waters of baptism. The pall reminds us of that baptism and that we are being renewed in the eyes of God as we embark on our last journey towards the Kingdom. In preparation for this, the Extra-Ordinary Ministers of the Eucharist have been trained on how to fold and place the pall on the coffin and they will be there to assist families at funerals. When the coffin arrives before the sanctuary, the assistants will bring forward the pall and place it on the coffin. The family will then unroll the pall to cover the coffin, which has the Cross and the Christian symbols for Alpha and Omega – the beginning and the end – reminding us that the Lord is present at the beginning and end of our lives. At the end of the Funeral Mass and just before the Prayer of Commendation, the assistants will come forward and – after the family have removed the pall – will take the pall from the family. The priest who will speak with the family in preparation for the funeral, will also speak with the family about this.